A day after a gunman shot dead 50 people at a gay nightclub in Orlando, police investigated the attacker's ties to ISIS and Americans grieved over the deadliest mass shooting in U.S. history. In addition to the people killed, he wounded at least 53 others, police said. During the attack, Mateen called 911 to pledge allegiance to the ISIS terror group and mentioned the Boston Marathon bombers, according to a U.S. official. 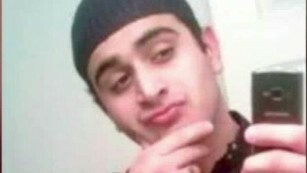 "It appears he was organized and well-prepared," Orlando Police Chief John Mina said. Authorities said they haven't found any accomplices. ISIS sympathizers have reacted by praising the attack on pro-Islamic State forums. Mateen's parents, who are from Afghanistan, said he'd expressed outrage after seeing two men kiss in Miami, but they didn't consider him particularly religious and didn't know of any connection he had to ISIS. Mateen was a normal husband at the beginning of their marriage but started abusing her after a few months, she said. She said Mateen was bipolar, although he was not formally diagnosed. She also said Mateen had a history with steroids. He was religious but she said she doesn't think his religion played in to the attack. According to a mortgage document, Mateen remarried a woman named Noor Salman and they lived in a Fort Pierce condo. 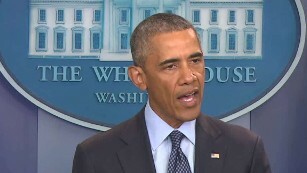 CNN's Sara Sidner talked to a source in Rodeo, California, who knows the family well. That source said Salman's mother wept and tearfully wondered "why is God doing this to me?" Mateen had worked since 2007 as a security officer at G4S Secure Solutions, one of the world's largest private security companies. A message posted in Arabic on a dark web site associated with the ISIS news agency Amaq said "the armed attack that targeted a gay night club in the city of Orlando in the American state of Florida and that bore more than a 100 killed and wounded was carried out by an Islamic state fighter." But CNN's Salma Abdelaziz, who translated the message and closely monitors ISIS messaging, cautioned about taking the message at face value. FBI Assistant Special Agent Ronald Hopper said the agency was aware of Mateen. The FBI interviewed him in 2013 and 2014 after he expressed sympathy for a suicide bomber, Hopper said. "Those interviews turned out to be inconclusive, so there was nothing to keep the investigation going," Hopper said. Mateen was not under investigation at the time of Sunday's shooting and was not under surveillance, Hopper said. In the past two weeks, Mateen legally purchased a Glock pistol and a long gun, ATF Assistant Special Agent in Charge Trevor Velinor told reporters. It's not known if those weapons were used in the attack. "He is not a prohibited person. They can legally walk into a gun dealership and acquire and purchase firearms. He did so. And he did so within the last week or so," Velinor said. Pulse describes itself as "the hottest gay bar" in the heart of Orlando. Hours before the shooting, the club urged partygoers to attend its Latin event Saturday night. The club is a vast, open space that was hosting more than 300 patrons late Saturday and into Sunday morning. People inside the nightclub described a scene of panic made more confusing by the loud music and darkness. "At first it sounded like it was part of the show because there was an event going on and we were all having a good time," clubgoer Andy Moss said. "But once people started screaming and shots just keep ringing out, you know that it's not a show anymore." Christopher Hansen said he was getting a drink at the bar about 2 a.m. when he "just saw bodies going down." He heard gunshots, "just one after another after another." The gunshots went on for so long that the shooting "could have lasted a whole song," he said. "I took my bandana off and shoved it in the hole in his back," Hansen said, adding that he saw another woman who appeared to be shot in the arm. Ron Hopper of the FBI answers questions from members of the media on June 12. Listening are Orlando Police Chief John Mina, left, and Orange County Mayor Teresa Jacobs. A police officer stands guard outside an Orlando hospital after the mass shooting. A SWAT team member arrives at the scene of the shooting. Medical personnel wait with stretchers at the Orlando Regional Medical Center. People wait for news outside the emergency entrance of the hospital. Police in Orlando direct family members away from the scene of the shooting early on June 12. Shooting victims are attended to by emergency responders outside the club. Emergency personnel gather outside the nightclub. Bystanders wait at the scene. Police officers respond to the scene of the shooting. 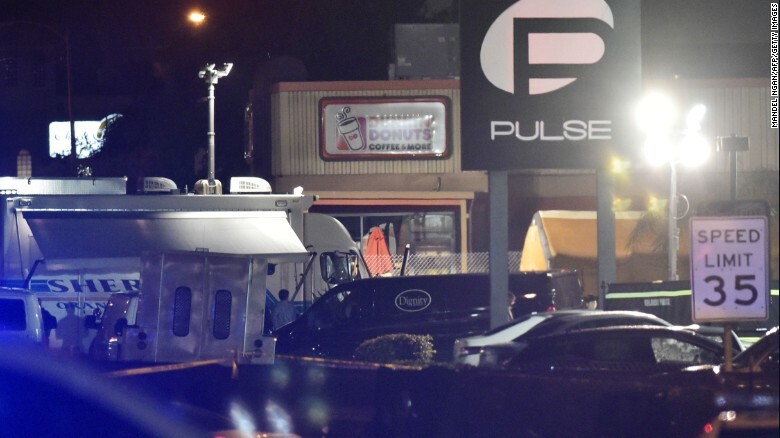 A van from a mortuary is seen in front of the Pulse club in Orlando, Florida, on June 12, as victims' bodies are removed from the scene of the mass shooting. Friends and family react after a list of hospitalized victims is released, implying the death of those who weren't on the list and hadn't been heard from, outside a Hampton Inn & Suites hotel near the Orlando Regional Medical Center on Sunday, June 12. Church pastor Kelvin Cobaris hugs Orlando City Commissioner Patty Sheehan and Terry DeCarlo, executive director of the LGBT Center of Central Florida, after a shooting at the Pulse nightclub killed at least 50 people and injured at least 53 on Sunday, June 12. Orlando police said they shot and killed the gunman. Jeremy Glatstein donates blood in Orlando on June 12. He drove an hour to the donation center to show his support for the shooting victims. A bomb disposal unit checks for explosives around the apartment building where shooting suspect Omar Mateen is believed to have lived in Fort Pierce, Florida.